Melody is eleven and she has never spoken a single word. She can’t walk. Or write. She lives with a head full of words and an intelligence that rivals most around her. Yet none of it is apparent except to her family and wonderful neighbour Mrs. V. Life changes when she finds a way to begin communicating with the world. Hers is a voice you might never forget. I feel so sad for Melody I can’t believe she is ten and has not said a word. Book club members: Just a reminder that we are going to try and read until the end of Chapter 5 for next week. See you at our Wednesday recess meeting. Excited to hear what everyone is thinking about what life is like for Melody. Comment here or wait to share at our meeting! This book is the best! I almost cried. Actually now that I think about it I did cry, just a little bit. Poor Melody I wonder how she can be in such a good mood most of the time. If it were me I would always be grumpy. She is quite a remarkable character isn’t she Jena? I’m so pleased that you are enjoying the book so much. Even if it makes you cry! Hello book club members! For those who missed our meeting yesterday, the plan is to read up to page 206 next week. I know many of you are finished and rereading sections again. Our meeting yesterday made my day when I heard so many people say that they couldn’t stop reading this book. I also love how Alyson and her Dad are both reading it! Maybe we will hear from him with a comment? Books are treasures and sharing our discussions together is a highlight of my Wednesday! See you next week in the library for our meeting where we will all be able to leave a comment here using the iPads! You really can’t judge a book by it’s cover! Melody in this case has proven us all wrong. she made the Whiz kids team. 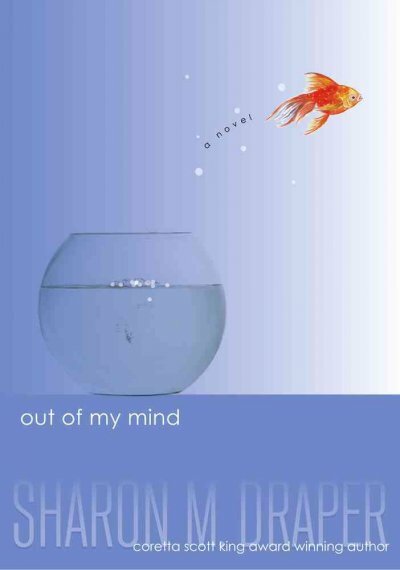 We can not look at someone with Cerebral Palsy the same way after reading this book. Sharon M. Draper has done a fabulous job in sharing Melody’s thoughts. We just can’t put the book down. Eddy, you just made my night! The first post from a parent on a book club book! I cannot tell you how exciting it is to us that you read along with Alyson (sharing the copy of the book and discussing it). She often shares moments from your discussions. What a wonderful Dad/daughter activity to read together like this! I am very impressed. Just wait until our next pick. But I’m not giving you any hints either! You will have to wait. In the meantime, happy reading! Absolutely love the comments…I think I might have to read this book too!!! I’ve read two of your other book choices this year…and can’t wait to hear what Eddy thinks about them!! Exciting!! You will have to read this book. Incredible title. And don’t you dare hint to anyone about our next book club titles . . . Top secret! I am beginning to think like Melody.. My thoughts are exploding with excitement waiting for the next book!! No, I don’t drool or swing my arms and legs. LOL. Lisa I am so excited that you love this book this much! Book club – the plan is to finish the book by next week so if you haven’t already . . . Happy Reading! Ms.Gelson i told my sister (Linda) To read it and now she’s addicted to the book. This is the best thing Lisa – when we literally pass on the book we love to someone else to share! It is fun reading a book with someone else in your family. My daughter and I often read the same books after one of us recommends a book. She has read this book too! Maybe Linda would like to comment? I think you will really like the next book too! why a sad book poor poor penny. I was just crying . next book must be happy. Oh Alyson. I feel for you. There are a lot of emotions in this book. And it certainly is hard to read it without your heartstrings getting pulled every which way. But, you know that when we cry and laugh as we read, we learn so much. I can’t wait to hear about what you think of the ending when we see each other next week.